This thirty-nine years old travel document is at the first look nothing special. It’s in great shape and has 48 pages instead of 24 pages. The document was issued to a man on 28 June 1980 and here the twist begins. The passports validity was set to 27 June 1980, a day before the issuing date. What a random finding. The local passport office finally corrected their mistake by extending the passport till 27 June 1982. Did you ever wonder how they issued such passports back then? Well, they used a special typewriter for passports. Some years ago I had the change to grab such a machine but due to the high shipping cost, I didn’t take the chance. 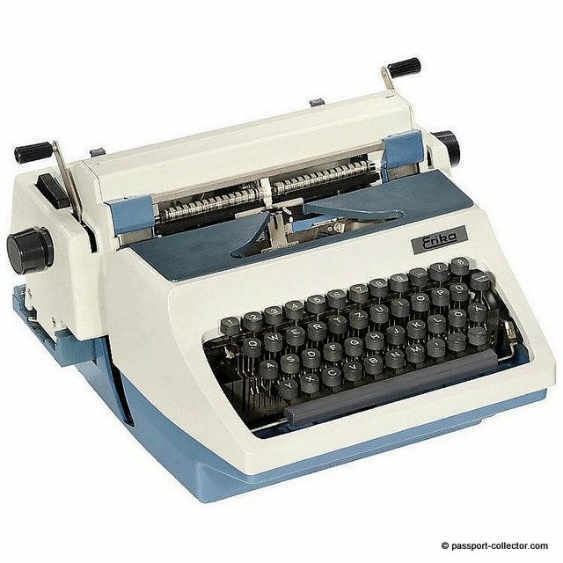 However, here you can see such an ERIKA typewriter. A museums piece nowadays. Manufactured in 1970 in the state-owned company “Schreibmaschinenwerke Dresden”, into which the former companies Seidel & Naumann and Clemens Müller had been converted. Condition: brand-new, The machine is unsuitable for single sheets, only thicker objects can be clamped into the writing instrument, which only has capital letters and a “ß” – after all, it was used exclusively to issue passports and driver’s licenses. The GDR was very progressive, at least in this aspect. While in the West German offices the identity documents were still partly handwritten in calligraphy, in East Germany Erika had already given the papers a more official appearance.